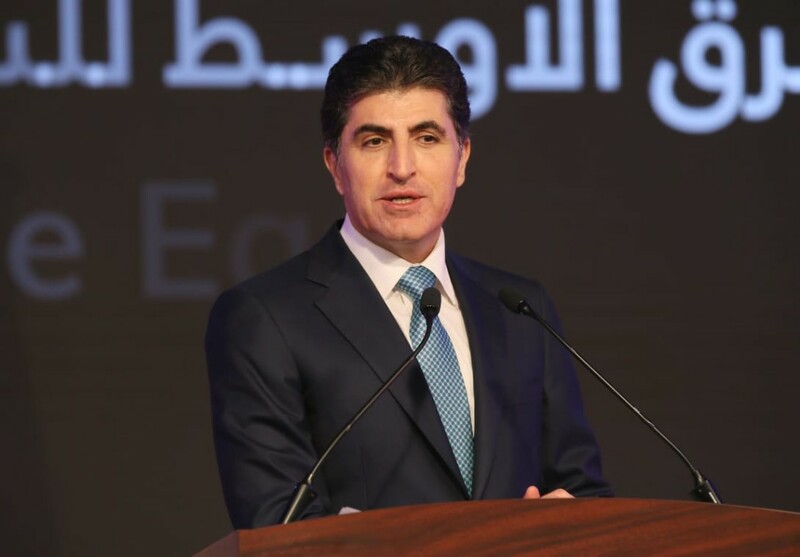 Erbil, Kurdistan Region, Iraq (cabinet.gov.krd) – Kurdistan Region Prime Minister Nechirvan Barzani opened the Middle East Tourism Exhibition in Erbil. Good morning and welcome to the “Middle East Tourism Exhibition”. I would like to especially welcome the Iraqi Minister of Culture, Tourism, and Antiquities Mr. Abdulamir Al-Hamdani, and the Head of Culture, Tourism, and Antiquities Committee of the Iraqi Council of Representatives. I also warmly welcome members of the diplomatic corps and other foreign representatives in the Kurdistan Region, Head of the Iraqi Civil Aviation Authority, all companies, investors, and guests attending this year’s exhibition. I am glad to attend this event and hope the exhibition helps to invigorate tourism in the Kurdistan Region. I want to thank the KRG Minister of Municipalities and Tourism Ms. Nawroz Mawlood and the Ministry for their assistance and support to this event. I want to thank the organizers of the “Middle East Tourism Expo” and the KRG General Board of Tourism in the Ministry of Municipalities and Tourism headed by Mr. Mawlawi Jabar. With its many attractive characteristics, the Kurdistan Region intends to become a prime center for tourism in the Middle East. With its natural beauty, breathtaking scenery, unexplored mountains, rivers, forests, archaeological and historical sites, the Kurdistan Region has great potential for tourism through all four seasons of the year. An important, distinctive feature of the Kurdistan Region is its people with their welcoming attitude and warm hospitality, who have always sought a secure and peaceful life. I hope holding such an exhibition will encourage entrepreneurs and investors to undertake tourism projects in the Kurdistan Region that will attract over the coming years an increasing number of tourists. We look forward to this exhibition promoting a wide range of high quality services that will make the Kurdistan Region a preferred destination for tourists from neighboring areas and throughout the Middle East. There is little doubt that if it were not for recent very difficult years, the Kurdistan Region would have developed its tourism infrastructure and services to a much higher level. For development of tourism in the Kurdistan Region, the KRG depends on the private sector for the crucial role it can play. To reduce our dependency on oil and gas, we need to advance to a new era of growth and development based on tourism, agriculture, and industrialization. Through this exhibition, I invite private sector entrepreneurs and investors, both foreign and domestic, to come to the Kurdistan Region and invest in tourism sector. The Region’s tourism potentials could be an important source of financial benefit and job creation. In order to protect and grow its economy beyond its current dependence on oil and gas, the Kurdistan Region should focus on diversification by developing its agricultural, industrial, and tourism potentials. With tourism as one of the Kurdistan Region’s main priorities, the KRG is ready to fully support and facilitate the implementation of projects by local and foreign entrepreneurs and investors. We know that rules, regulations, routines and administrative procedures might discourage investment. Today, in this event, I assure you all that the Kurdistan Region through its reform plans will do its best to eliminate these defects and provide more attractive investment opportunities in all sectors. From its beginning, the policy of the KRG has been to enable the private sector to be an active partner in reconstructing and developing all sectors in the Kurdistan Region. In the next phase, participation of the private sector will be broadened to develop tourism, agriculture, and industry sectors. With great hope, we look toward further developing our relations with Baghdad. We want to solve all issues in accordance with the Iraqi Constitution. We hope this will encourage entrepreneurs and investors to develop and support projects in the Kurdistan Region from where they can extend their efforts to other parts of Iraq. During upcoming Newroz festivities, I kindly urge all KRG security forces and other relevant authorities at checkpoints and airports to act in a hospitable and professional manner when they receive thousands of our Iraqi brothers and sisters as well as visitors from other countries, and to provide them with every possible support and facility. Our culture of tolerance and coexistence should be reflected in the actions and manners of all security forces and relevant authorities at checkpoints and airports. Our Iraqi brothers and sisters who choose to come to the Kurdistan Region are visiting their own country and should never feel that they are visiting another country. KRG authorities have predicted there will be crowds during this year’s Newroz festivities and I’m sure the security forces will do their best. I kindly request the security forces to help tourists and guests as much as they can. To protect Kurdistan’s natural environment during their picnics, I call on our citizens and visitors to keep our Region clean. In the end, I would like to, again, welcome you all. I thank the KRG General Board of Tourism and the “Middle East Tourism Expo” for organizing this exhibition. I hope this exhibition will pave the way for further collaboration as well as signing many contracts for investment projects. I think such events are crucial and should be made annually.